Dynamometers available from 5 to 100 Tn. Load cells available from 5 to 150 Tn. Contact us for other capacities. Includes glycerine filled gauge with maximum indicating pointer. Can be used for measuring tension loads in cables, tensile testing and can be used as a weighing device. 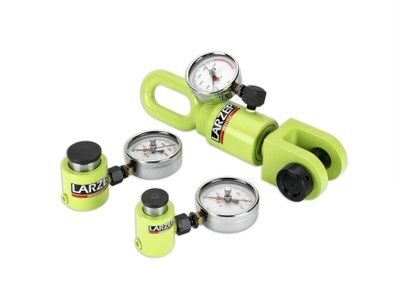 Portable compression load cells, measure loads in compression. Remote mounted gauges with 0.8m hose, AP2008.